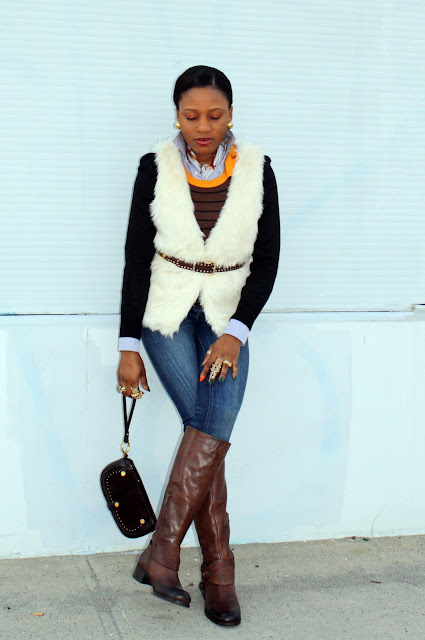 Dying for a fur vest! I have my eye set on one so hopefully once I get it at a good price it'll be mine :) LOVE the dark brown fur vest! very cute outfits. i love both vest and the second outfit pair of shoes! very stylish. thanks so much for visiting my blog and for your sweet comment. both looks are amazing I love how you both incorporated the stripes in your own way!!! It's very, very hot here in Brazil now, but the outfits are great inspirations for the next season. Tati. I love the fur vest. The whole ensemble is amazing. LOVE the fur vest and how you belt it on the outside. Gorgeous! those jeffrey campbells are hot piece. Love the fur vest, girl! I love the title of your post, fur days to go? You two look fantastic as always! I love the way you ladies layered your outfits. 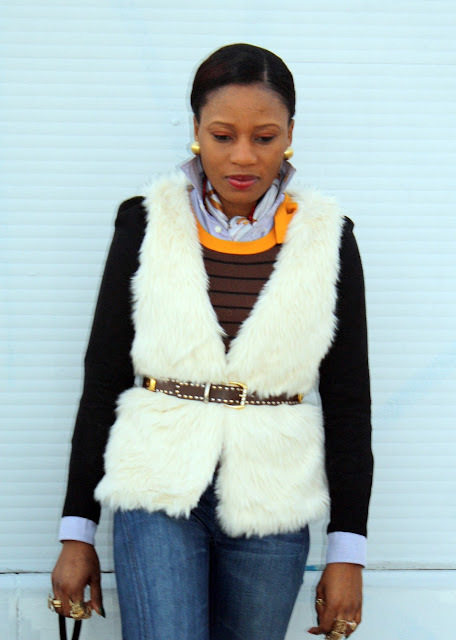 Thanks for giving me mad inspiration on how to style my vest from F21. FAB styling!!! you guys are excellent with layering! I love both outfits!! You both look great! I am loving the JCs and both vests! 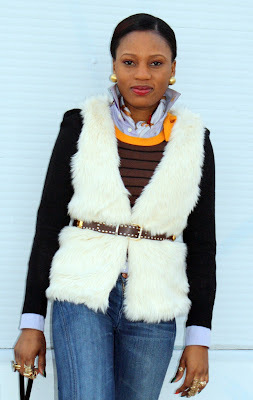 Iam afollowing you back on GFC an bloglovin! Two great outfit! And I really like the titel of this post! Love your blog, it's so great! I hope we can follow each other on bloglovin'! Your furry vest is fabulous! Great look, loved the vests!! Nice layering w/ the vests, ladies. I like the colorful choices underneath the vests. 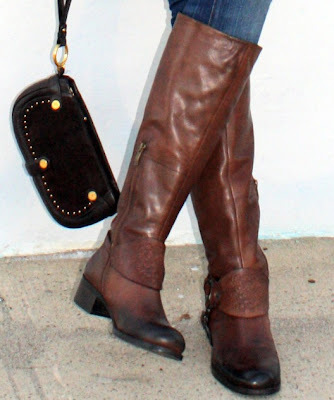 I really like those Vince Camuto boots. You are both amazing!!!!!!! I love love love the second ones shoes!! Love that furry vest and that JC shoes is one amazing shoes !! We loved the fur vests. The belt was very nice also. I adore these looks girlies! Fabulous! You two have such great outfits, I love the fur vests :) now following. And by the way, your header looks so cool, love it! Oh I love how different, yet equally chic your looks are! the first caught my eye with the polished elegance of the layers, but the second is so badass! Wow! you booth are so amazing! i like almost every piece of your outfits! Wow love the outfits you're wearing, and those shoes are killer!!! 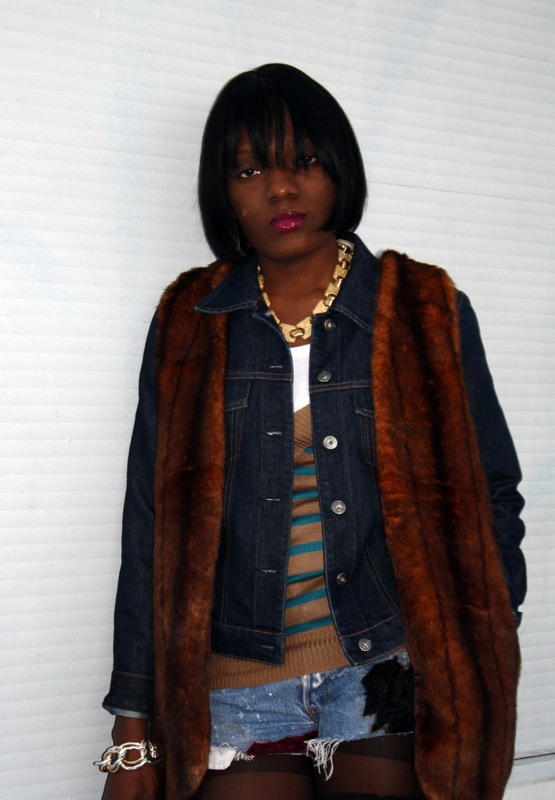 Dying over the fur vest and the vintage Versace belt. I can't believe that's from H&M. i love the creeper like shoes ! love the layering in both outfits! ;) looking good ladies, Happy Holidays! thanks for always leaving us some love on our bloggy! I love the outfits, amazing looks. these looks are so gorgeous! seriously love the layering:) have a wonderful christmas! nice pics!!! the fur coat i so love... both outhfits are really so chic and lovely!!! you two are very beautiful!!! following you now..
Love these looks! The layering is so beautiful, love your style! Your blog is awesome, I'm now following. Hope you had a wonderful Christmas! great layering! you both look fab! Love the look with the upturned collar shirt ! Amazing ! The upturned collar is so beautiful, love your style! These looks are so gorgeous !